It was a good year. 2009 was also good. They were both a lovely break from years 2005-2008, which were just generally stinky. Mostly- I just feel blessed. I feel taken care of. I get on my knees and say thank you to God every day simply for having enough. Enough family, enough friends, enough food and shelter, enough security, enough love- anything a person really needs, I have enough of. It doesn't get much better than that. To end this year- pop over and read this article written by a friend of mine before the link breaks. I loved it. 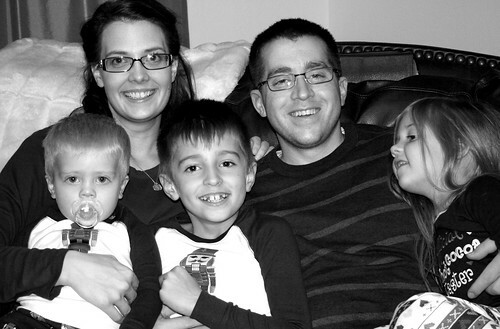 Family photos are so impossibly hard to make happen. This may be as good as it gets. Kids can get away with looking goofy, because goofy is cute. How big is Gabe? SO BIG! (And so cute). 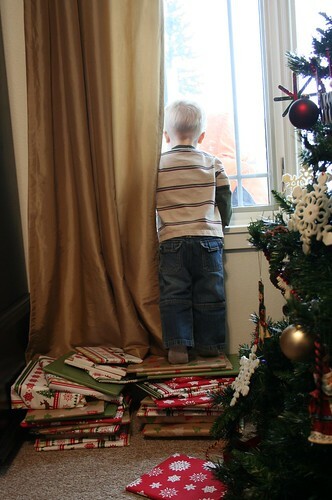 I love that moment in Christmas Eve, after Santa has visited and everything looks like a postcard. So peaceful and so pretty. Here we are again. Trying not to look scary. 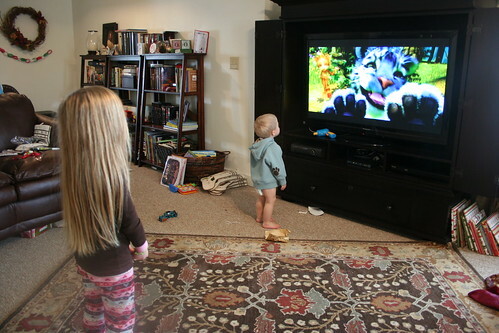 We played a lot of Kinect with the family, and had a blast. We also ate a lot of great food and relaxed. And since my parents and I are the type who love to work, we cleaned out a few closets and hung some pictures on the walls. My house always seems better after my parents have visited. The absolute best thing? Dad switched my washer and dryer around so the doors don’t swing open to block each other. My life is so much better now! I took remarkably few photos. That has been happening a lot lately. Truth be told, I wasn’t as in to Christmas as I usually am. I’ve been in a bit of a funk, and the old merriment was hard to come by. There was a lot of stress and lethargy, and so we slowed things down, simplified and enjoyed the things that matter most. I really couldn’t get into the spirit of things. Even on Christmas Eve, up to my elbows in a turkey, watching the Norad Santa Tracker and listening to Carols- I wasn’t feeling it. I mean, it was a good day, but not CHRISTMAS. And then, come evening, we sat around our table ready to eat Christmas dinner, and asked a blessing on the food. At that point, I felt Christmas so strongly I nearly cried. It really has nothing to do with the presents or turkey- it is all about the Spirit of Christ, and I am so glad that it was felt. We started a new tradition for Christmas morning. We always get stockings and then sit down for breakfast before diving into gifts, but this year Chris wanted to hold a short testimony meeting to give each of us an opportunity to share or faith in our Savior and to truly reflect on His birth and what that means for us, individually. It was beautiful hearing my children tell what they knew and felt. This is a tradition we will keep. 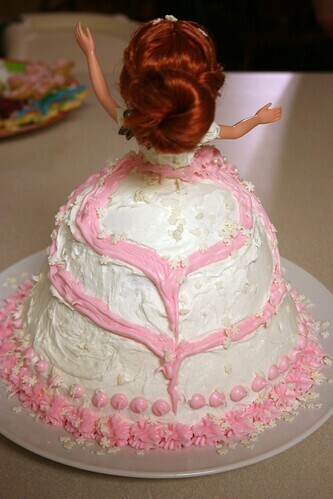 A Doll Cake For A Newly Minted SIX Year Old. I cannot believe Maggie is six. Honestly, it blows my mind. Imagine every cliche about kids growing fast- that is how I feel. 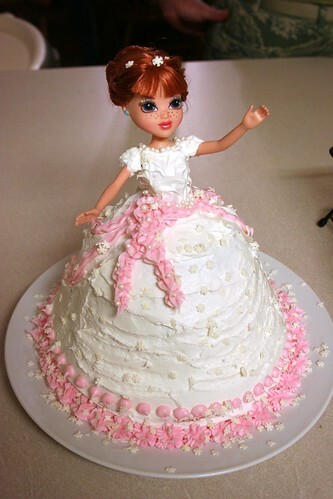 My mom thought to do a doll cake the day of the party, so we ran to the store, bought a doll, and whipped it up while Maggie was at school. It was set to be a total surprise, and I figured she would absolutely love it. And boy was I surprised when she nearly cried because it wasn’t the kind of cake she wanted. Turns out she didn’t realize that it could be eaten, and she also thought that I totally destroyed the doll making it. Once she found out she had a new toy AND cake, we were good to go. 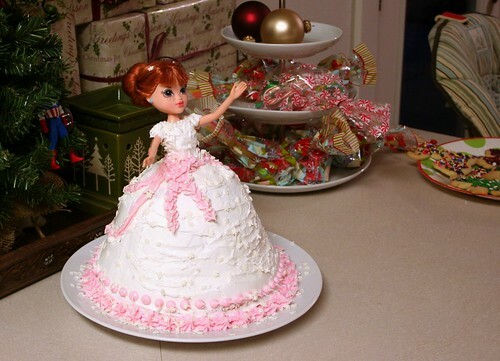 This is the Winter Snowflake Princess- it’s like Queen Frostine meets Cinderella. I am very proud of her sassy sleeves and her pearl accents. Frosting art is more fun than I expected. 4 Comments on A Doll Cake For A Newly Minted SIX Year Old. 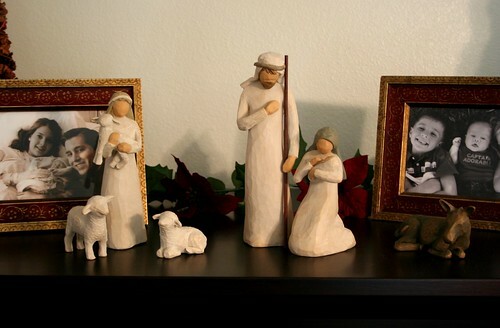 I love Christmas, and I love the Savior. The stories surrounding His birth are amazing, and the people in them are incredible examples. The program below had a lot of music interspersed with it, but when it is all said and done, it is quite simply, my testimony of Christmas. 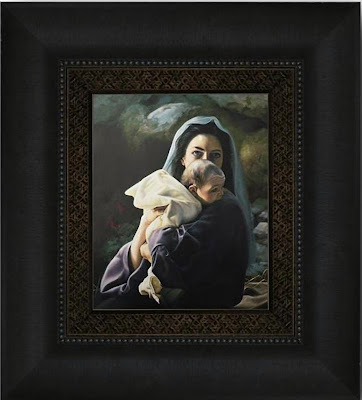 This painting is by Liz lemon swindle, called “Be It Unto Me”. It’s one of my favorites, and on my someday list for my home. Two thousand, six hundred years ago, the prophet Isaiah delivered a prophecy that would have the power to humble kings, inspire the meekest children, and shake great nations at their very foundations. This prophecy announced that our Father in Heaven’s only begotten Son would be born into this world. Isaiah prophetically promised that Christ would be our Messiah, our Savior, and would come into the world for us. He would take our most scarlet sins, and make them white as the driven snow. He would take our pain, and make our burdens light. He would turn tears of sorrow to tears of joy. By His stripes we would be healed, and through Him, the only path back to our Father in Heaven would be created. It was the greatest message of Hope ever given. Isaiah 7:14 Behold, a virgin shall conceive, and bear a son, and shall call his name Immanuel. It was a humble beginning. 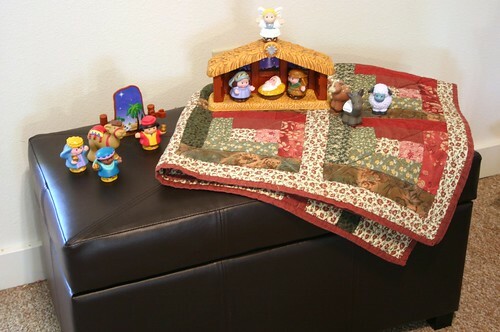 Mary and Joseph had little by way of worldly possessions. They had traveled a hard road at a difficult time, and struggled to fill even their most basic needs of shelter and rest. They were two very meek people; almost unnoticed, trying simply to make their way and serve God as best they knew how. As angels sang His praises, shepherds ran to greet the newborn King. They made haste, following the star, seeking out the foretold Savior, and when they found Him, and saw the miracle with their own eyes, they left to tell the world. They glorified and praised God for all the things that they had heard and seen, and after they had made it known throughout the land and abroad, they returned home, coming to worship the Christ Child. The Wise Men traveled from afar, searching out the Son of God. These were spiritually sensitive men, privileged to be on a divine errand to come to know Christ, and lay their gifts at His feet: Gold, a gift for a king, celebrating the baby’s royalty. Myrrh, a common incense used for burial, in remembrance of His humanity, and foreshadowing the significance of His death. And Frankincense, an incense used in the temple, representing His divinity. For unto us, a child was born; unto us, a Savior given. And truly we do call His name Wonderful, and find in Him our Counselor, our Prince of Peace. This immeasurable gift from the Father was and still is for our sake. We must only come unto Him to receive it. 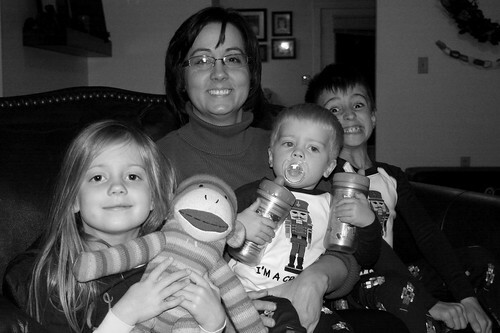 Our lives today are fast paced, and growing ever busier. It can be so easy to lose sight of the Savior in the midst of the glitter and noise of an increasingly wicked world. Humble seekers of Christ must learn to recognize Him, and to find Him amid the chaos and confusion. Followers of Christ know how to listen as the still, small voice testifies of Jesus’ divinity and enduring love for us, His brothers and sisters. Like wise men of old who sought Him over plains and seas, do we search for Him in our scriptures and through the words of living prophets? Does coming to know Christ inspire us to go another way, to walk the path that He has shown? Like Shepherds, do we testify of Christ boldly and with excitement, letting our faith and our lights shine? 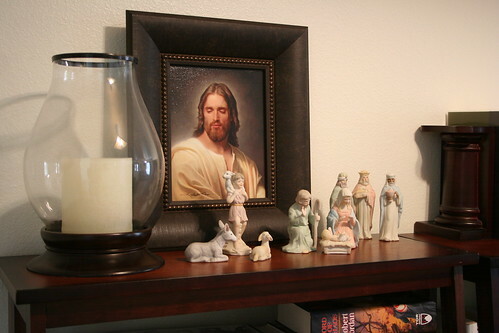 Like Mary, do we keep these things in our hearts, and do we truly understand what the Savior means when He says, “Peace. Be still.”? Let us come unto Him this Christmas season, ever growing in faith, believing in His holy name, receiving His blessings and His miracles until every voice is lifted up to praise the Prince of Peace. Perfect Is What You Make It. Today I re-baked our Christmas cookies. Ordinarily, I am quite on the holiday-ball and my baked goods are all nestled, snug in their plastic containers, waiting it out until it’s time to be either eaten or given as gifts. This year I baked 84 cookies, and covered at least 1.8 million pretzels in chocolate. This took hours. I put almost all of it into the freezer, and planned my next move. At that point I fell into a funk and absolutely nothing was achieved for about a week. It was during this week that I sidled up to the freezer with the intent to steal a cookie (or five), and found that someone had beaten me to it. There were three large containers in my freezer (one with a newly broken lid), and exactly three cookies and seven and a half pretzels. Now, I know someone ate all these cookies, and I would put money on several someones. However, I cannot get a confession out of anyone. My husband swears he had only a few. One kid admits to two, the other flat out denies all cookie contact. The youngest cannot open the container, but I am sure that he was plenty busy following his family’s crumb trail and eating anything he could swipe. I know this kid; that’s how he rolls. So yesterday I baked another double batch of cookies, and this morning I spent about two hours frosting them all. I have a bag of pretzels here and some chocolate, and hopefully something good will come of it. I am pretty sure that this will be one of those Christmases where the baked goods are fairly scarce. I had good intentions of making a few other goodies, and even trying out a few new recipes, but it just isn’t going to happen. I’ve come to terms with it. I’ve come to terms with many things this Christmas, as our routine has been quite different from past years, and my energy and enthusiasm have been in short supply. Not being in California, I lack access to a few of the traditional “must haves”. Certain treats and gifts are simply not going to be in the picture because certain shops don’t exist here. I have to change my brand of chocolate Santas for the stockings, and no matter how much I want to buy a few nice ties for the men in my life, there aren’t any outlets around here where I can get them at rock bottom prices, so I’ve gone different directions. We haven’t watched any of the usual holiday fare yet because I haven’t been in the mood. 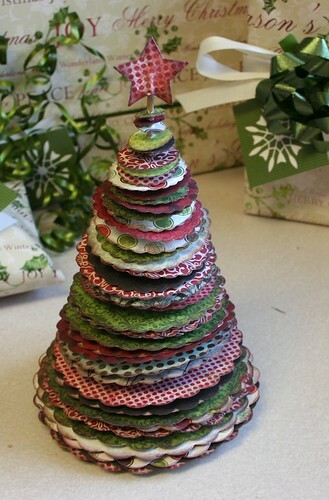 I can’t even imagine having the time for Christmas cards, so I’m taking the year off. I even scaled back (intentionally) the gift giving. It isn’t that big of a deal. 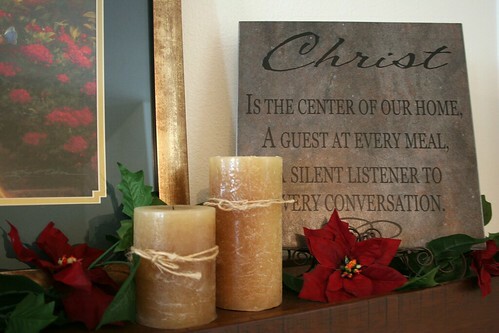 I think this will be a very quiet and simplified Christmas, and I think that’s good. The very most important traditions are kept, of course. 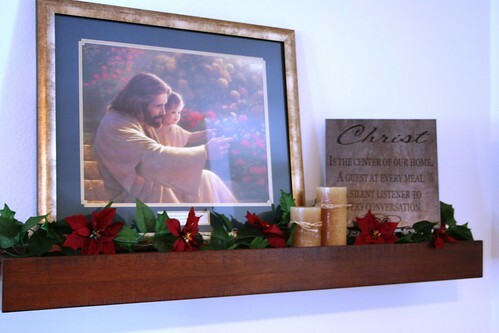 The Savior is focused on almost nightly through our Christmas books, and every morning as we sing hymns and carols about Christ’s birth. 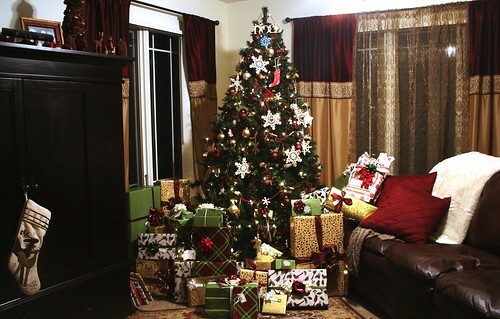 Santa gets his spot in the lime-light as wish lists are written, and stockings are filled. The tree and house are resplendent, covered in baubles and good smells, and the music of the season is in the air. Chris and I sit down most nights with a cup of cocoa and snuggle. It is the same brand of cocoa we used to buy when we were newlyweds, and that we couldn’t find when we moved to California. It is a tiny, tiny thing, but it makes me happy. 5 Comments on Perfect Is What You Make It. I’ve been playing with paper! This new Pink Paislee Sweetness line is just darling, and I am loving the new Lifestyle Crafts die release. 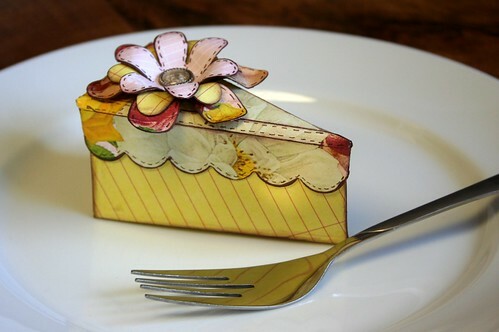 This cake die just has too many possibilities- also- it’s a box! 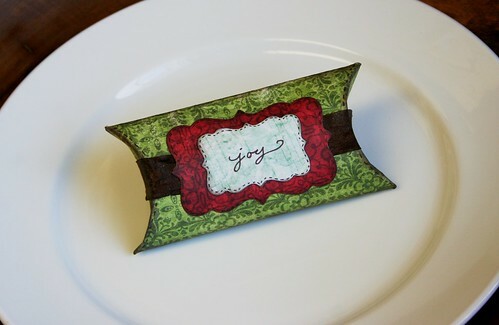 Such an adorable party favor idea! Thanks for checking out my creative moment! 1. It melts by light bulb, so you lose the fire hazard danger of candles. This is especially great for workplaces, military housing, dorms and other places that frown on candles. 2. There is no smoke or soot mess like there would be from an open flame. 3. You control how much fragrance you want released by putting more or less wax into the melter. No more overpowering, accident in the perfume factory incidents. 4. The wax is long lasting and inexpensive, so it is very cost efficient. 5. The warmers are cute and can be coordinated to match your decor. 6. You can switch out waxes at any time, without waste. 7. Warmers come in three sizes, so you can fit Scentsy anywhere. Scentsy also makes some other great products. I really like the Scent Circles- one of these in your car or closet or any place that needs a little freshening up works like a charm. I also like the travel tin. I have one of these slipped into our kids’ bathroom. 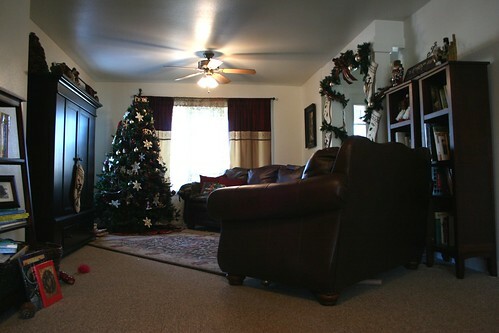 That room has always had a musty old-water smell to it (it’s military housing, what can you do? ), and this tiny tin totally masks that. You can open it as far as you like to control the power of the scent, and it lasts much longer than similar things I’ve tried. There are also these adorable Scent Buddies- cuddly stuffed animals with scent packets tucked inside. You can choose soothing lavender and other comfort fragrances to help tuck your little one in at night or casually freshen a bedroom. You can get the wax in bricks and bars. Bricks are what you buy your favorite scent in, and bars are what you try things out with (and the bars do last, so you will be set for awhile). If you are a fist timer, I recommended this deal here where you get six bars for the price of five and can try out a few of my favorite scents. You can see that and other combo deals here. Now – if you are going to order (this is a great Christmas gift, so one for you, one for a friend), you will want to do it through this page here where it says Life as Lou party. This is how Trish will keep track of my readers, because my readers get a bonus goody in every order. You’re welcome. Now of course, ONE of you is going to win this. ONE of you will walk away with a mid-sized warmer and one plug-in of choice and 2 scents. This is a great way to get started, and a great gift for that last person on your list, so good luck! a. Leave a comment on my blog naming your favorite warmer and 2 scents you might like to try. 1. Sign up for Trish’s mailing list. Go to her site and click “receive my newsletter”. 2. Place an order by December 15th. Each person will receive a free incentive with purchase as well. They can order from my site by clicking “Buy from Party” next to the the “Life as Lou” party name on the left hand side of the website. 3. Email Trish at TLHarwick@gmail.com and request more information about becoming a Scentsy consultant. New consultants will receive special bonuses. 4. Sign up to host a party. This is easy. I send all the required materials and the hostesses receives the benefits! Contact Trish at TLHarwick@gmail.com for more information. 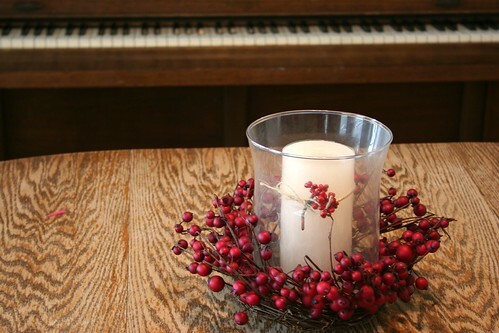 PS: If you want to see my warmer you can take a gander at my Christmas Decor post- 2 below this. I like mine. Also, I am allergic to most fragrances, but I am ok with almost every Scentsy scent I’ve tried. No idea why that is, but I think it’s pretty great! Winner will be announced on the 16th, so hurry hurry and get yourself entered! Raise your hand if you’re a people pleaser who thrives on acceptance, praise and would prefer not to negatively rock the boat. If your hand is raised, you just might understand me. Funny, isn’t it, how a person can be this way in a world where any choice that you make will, inevitably, make someone, somewhere upset. In fact, a choice that will make half the people you love and cherish happy will probably make someone else you love and cherish downright pissed off. Lesson learned? You can’t win. STOP TRYING. My life has a lot of hot button areas just begging to be judged. 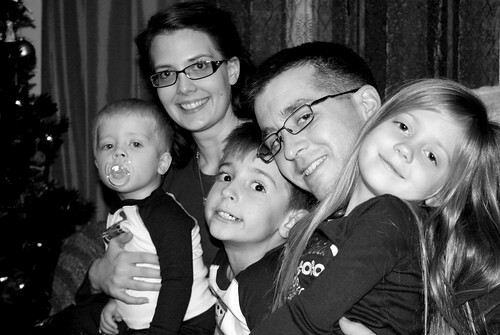 I’m a person who brought three children into this world, someone who married young, is primarily libertarian, is supportive of the military, pro-choice and Mormon to boot. (I know, wrap your head around that one.) I’m sure that almost every single person reading this has a negative comment to make on at least one of these lenses through which I can be viewed. The only suitable response lies somewhere between “whatever” and dropping the F-bomb. (That isn’t a very good Mormon thing to say, so don’t forget to judge me on that too). My point is that I expend an awful lot of energy trying very hard to keep people happy with me, caring about what other people think, and I am becoming keenly aware that it just might not be worth the colitic ulcer I’m giving myself. While it is easy to forget about the random comment or look of disdain on the street, it is harder to brush off when it comes from people who have opinions you usually value. I really don’t care if you don’t like the brand of my purse or shoes or think I’m unattractive or loudmouthed and pushy. There are things about me that I am solid on, and you’re wasting your time trying to convince me otherwise. That being said, I find it hard not to stew when people make negative commentary on areas of my life where I do have sensitivity left. It can make me doubt myself, even though I am basically satisfied, content and pleased with the direction my life’s choices have brought me. And it hits home the worst when the judgment is on my children. Child judgment is an especially raw nerve as it insults both someone who you love dearly, and you as their primary teacher. It’s the verbal equivalent to stabbing the knife in and then twisting it. And on the especially challenging day when it comes from someone who you would really like to have happy with you- well, we’ll just call that a whole bunch of lemon juice poured on that wound. Regarding this particular brand of unwanted opinions, I think that it might be time to stop apologizing for myself. I don’t really need to justify anything I’m doing to anyone. Don’t like what I’m giving my kids for Christmas? Whatever. Can’t agree with what I’m feeding my kids? Eh. Think I’m doing everything wrong? Shut up. There is absolutely no reason for me to take crap from people who aren’t living my life and who are not required to live with the consequences of my choices. I like that. Except that it excludes a lot of people I do love (and occasionally I find myself on that list), so I think I’ll amend it to simply apply to people who are like that more often than not. (See? I’m still nice, and I cut slack). This week, I found myself thinking about the whole “Word of the Year” trend. I’ve had some good words. Endure. Embrace. Priorities. And I’ve done pretty well at making improvements, or at least consciously dealing with that particular attitude or aspiration. This year, after much reflection, my word is going to be Screw You. (I realize it is two words, so just say it really fast if that bugs you). My grandmother once gave me some of the most solid advice I’ve ever received. In relation to the topic I’m addressing, she simply said, “Leah, tell them all to go to hell.” Everyone who isn’t making my life better should get a mental response of that nature, because they aren’t worth dwelling on and frequently their opinions aren’t even worth dignifying with a response. That old, crude saying about people’s points of view and rectal sphincters rings very true, and should be considered frequently. I’m sure most of you will enter the New Year with goals to eat less sugar or exercise or update your blog more frequently. Your words are probably nice and positive little butterflies like “Hope” and “Patience”. That is commendable. I applaud and respect you. But I’m going for a full attitude adjustment where it is needed, and letting “screw you” be my friend and guide. So there you go. If I seem more cranky and less tolerant and loving from this point on, congratulate me on really giving heed to my year’s goal, and making such fine progress. And if you don’t like my goal. . .well. . .you know what I’ll say. 28 Comments on Screw You. 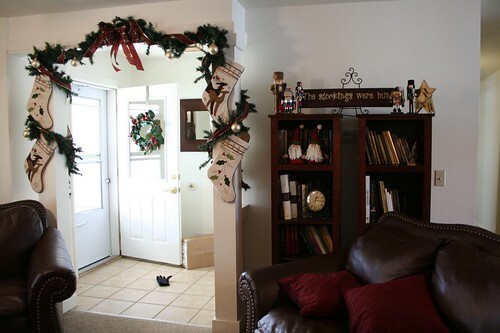 I always get a kick out of seeing how people decorate, so today, I will take you on a tour of my Christmas decor. The living room. Up on the armoire: Pinecone trees, pinecone candles, wooden forest critters from Jalu wood creations, nativity, family pics, garland. It needs something in back. I had a good idea, but it was crazy expensive. Maybe next year. 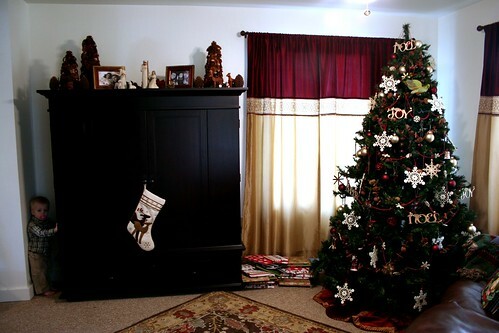 The tree is a woodsy theme, felt snowflakes, burgundy and gold baubles, pinecone and berry garland, white lights only. My favorite nativity. This was my mother’s. She gave it to me as a wedding present. 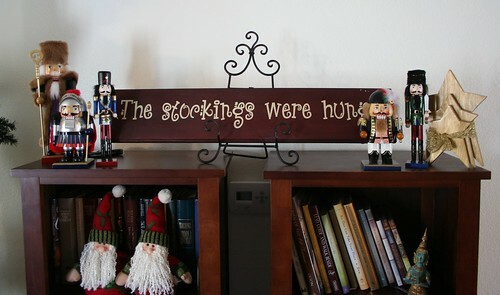 Cute sign my Mom made for me, nutcrackers and Tomten. Recognize this guy? 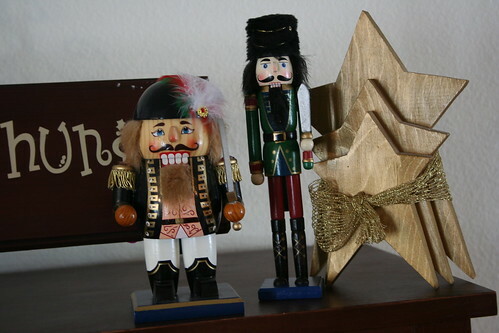 Bonaparte, the nutcracker. . .the short nutcracker. I had to have it. Are you hating that fan? I hate it too. I like the rest though. 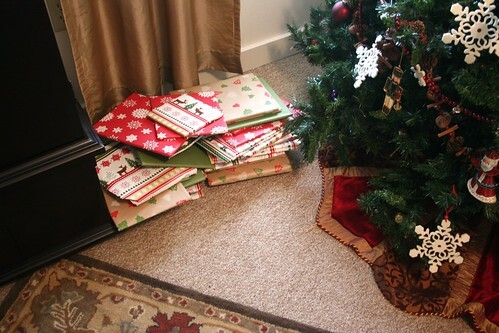 I’m laughing at the roll of wrapping paper under the couch and the toys peeking out. Its never clean. Ever. Even when I think it is, I am proven wrong. 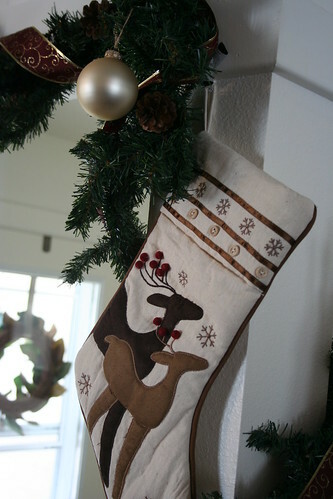 Stocking close-up. We have reindeer and holly. This is always up, I just swapped out the leaf garland for poinsettias. Did the same thing on the armoire. 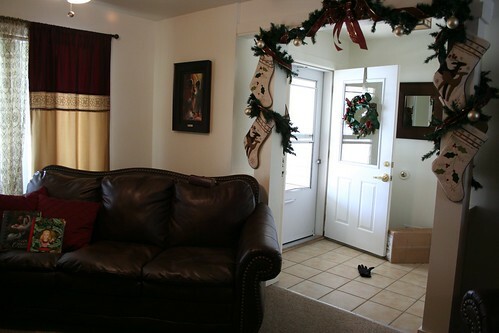 The entryway. Look, a random hand crawling around on the floor! 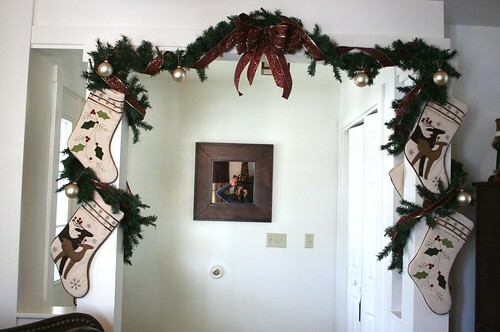 My garland and stockings and look! There’s me, waving to you! 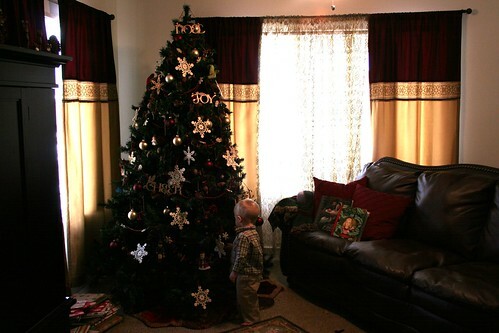 Gabe investigating the tree. Touch with ONE finger Gabe! Only ONE! Better yet, go touch this instead. I found these cardinals this year at Hobby Lobby. 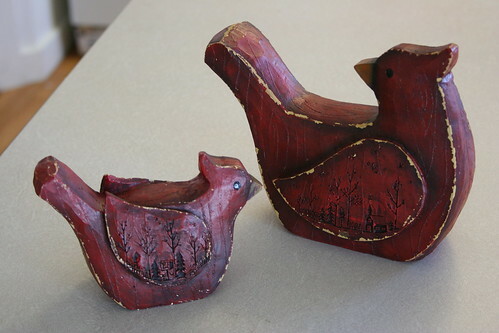 Maggie calls them “The Red Chickens”. I like my red chickens! 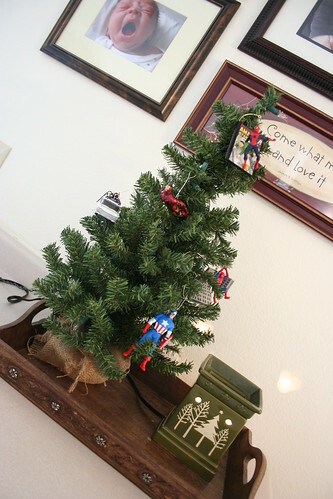 Our super hero tree. Every year the kids get Chris super hero Hallmark ornaments. We have enough for a tree this year. Next to it is my Christmas Scentsy warmer. Gabe watching the big kids play and using the presents as a stool. 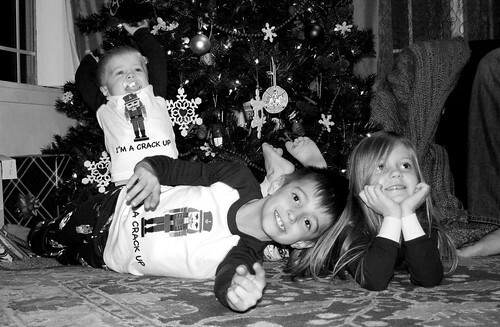 This is the kids’ favorite tradition. I collect children’s Christmas books and wrap them all each year. We unwrap them for bedtime stories in the weeks leading up to Christmas. There you have, folks. Thanks for looking!